We used whisks this year to help hold the eggs and it was pure genius. Thank you Pinterest! Ummm since when does Avery look more like a little girl than a baby!?!? 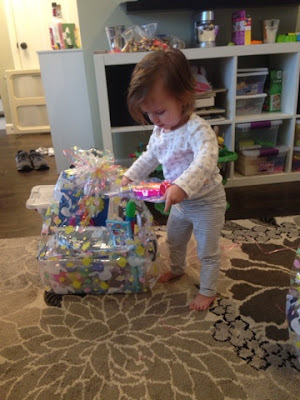 Easter morning started off with their baskets. The kids loved everything they got! 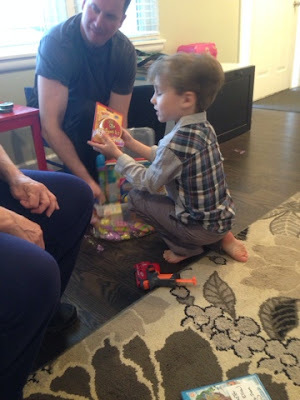 Then it was off my to my in laws for Easter brunch and another egg hunt! There were so many eggs and Brayden was the oldest cousin/sibling there so he of course cleaned up! The kids enjoyed WAY too much candy and it was a really nice time! We all headed home for naps and relax time then my Mom came over to give their kids their baskets. I think it's safe to say they had a great Easter!